The best thing about Poseidon is that — minus its lengthy end credits — the movie is a scant 90 minutes. With a titanic production budget that would make James Cameron weak in the knees, the cost to mount this not-so-lavish film amounts to approximately $1.8 million per minute. Having already made movies about submarines (Das Boot), sleek airplanes (Air Force One), fishin’ boats (The Perfect Storm), and Trojan horses (Troy), director Wolfgang Petersen has turned his penchant for unconventional modes of transportation toward a super duper high-tech luxury cruise ship. Maybe next time he should go for something simple, like a movie about a boy and his bicycle (oh, wait... Spielberg already covered that one in E.T.). 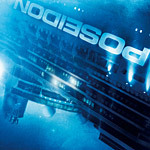 A remake of the 1972 Irwin Allen disaster “classic,” The Poseidon Adventure, which was in turn based on a novel by Paul Gallico, Petersen has not only clipped the running time but also the title to the terse Poseidon. There’s an uneasy feeling as Poseidon launches. The nausea has nothing to do with being seasick. It’s more like being stuck at a cocktail people with a bunch of strangers you have no interest whatsoever in getting to know. Maybe that’s why Petersen, who apparently has better things to do with his life these days than taking the time to construct a movie with characters worth giving a hoot about, quickly introduces the cast (most of them are doomed anyway) then throws them into chaos. Mr. Special Effects Man, that’s your cue to load up the “rogue wave” on your computer and capsize that big ol’ boat like it’s nobody’s business. It’s New Year’s Eve and everybody on the posh, obnoxiously expensive liner has a sob story to tell long before the wave hits. Trying to bring those cookie-cutter stories to life is a checklist of talent from Hollywood’s A-/B+ list. For starters, there’s the gay architect, Richard Nelson (played by a shockingly thin and balding Richard Dreyfuss, Jaws). He’s so upset about his boyfriend breaking up with him, he takes his first steps to jumping overboard when he sees Mother Nature is about to wrap up his life for him. Naturally, instead of following through with his suicide, he retreats into the rock-solid safety of the ship. Then there’s Robert Ramsey (Kurt Russell, Escape from New York). He saved a bunch of people from a burning building before becoming mayor of New York. Now his struggles revolve around his disrespectful daughter, Jennifer, whose boyfriend makes him nervous. Since she still lives under his roof, it seems Robert would’ve been able to scotch the boyfriend even coming on the trip to begin with, but thoughts like that only further spoil what’s rotten from the get-go. As Robert’s daughter, Emmy Rossum draws one of the cast’s shorter straws in a role that is particularly disappointing. After showing so much talent and promise in The Phantom of the Opera, here she’s shipwrecked with pure vanilla material. Josh Lucas (Glory Road) gets another crack at full-blown stardom here and he should take solace in knowing his career will survive this unmitigated disaster of a disaster flick. As Dylan Johns, Lucas plays a Navy man turned rogue gambler, but one who’s all too quick to take on the extra baggage of some eight or so other characters looking to him to save their lives. There’s also an obnoxious drunk guy, but mercifully he gets whacked in the early going. Throw in a mom/son combo and a stowaway with her own silly tale of woe and that’s about all there’s room for in the super-sized hull of Petersen’s movie. Well, OK. There is one more story. Fergie, the ultra-hot leading lady of the Black Eyed Peas makes a cameo appearance as a lounge lizard, ushering in the new year with Auld Lange Syne and other, more poppy, tunes. Unfortunately, she’s left to go down with the sinking ship and its captain. It’d have been more fun if she had been brought along on the escape; at least she’d supply a lot more eye candy and live to tour another day. Maybe after so many real-life disasters occurring in rapid succession over the past few years it’s no longer fun to see this type of disaster flick. Then again, maybe this movie isn’t fun simply because there are no brains behind the wizardry of the disappointingly mediocre special effects (those end credits list an incredible number of effects houses that worked on the project). It certainly doesn’t help matters when, amidst all the shoddy storytelling, after the chosen ones manage to jump ship they land right next to a rubber lifeboat. Failing to create even remotely compelling characters, there’s no tension or thrill in watching Poseidon. The only bit of fun is in seeing the drunk guy get his due. The biggest problem, then, is that Poseidon is another high profile, massive-budget extravaganza that is ultimately a tremendously wasted opportunity. Instead of capturing that good ol’ fashioned American spirit of teamwork and compassion, this is a soulless wonder with no redemptive power whatsoever.